Is it hard to chop something into pieces fast? Is it difficult to make a fast breakfast? Have you ever chopped your finger while you were chopping something? If so, you should try Rapid Chop! It provides a safe, fast and skillful chop! I know you chopped your finger suddenly before. 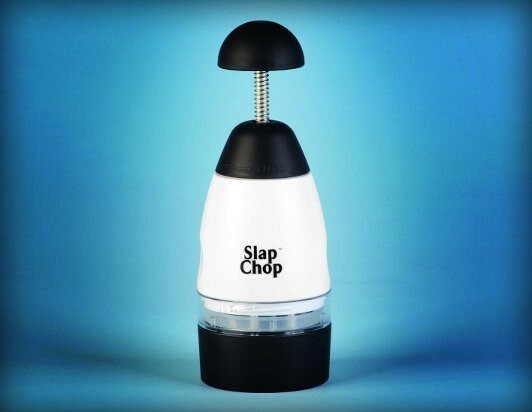 However, after using the Rapid Chop, your life changed completely. There is a cover near the knifes. Also, you don't need to put your hand to hold the food while chopping them. What you need to do is to put the food into the cover. Then, slap the button fast and you can have a meal now! Everyone wants to have a breakfast in the morning. However, we have no time. Therefore, you need the Rapid Chop to help you. It contains 6 knifes in it. However, the knifes are all in one. Therefore, you can clean it easily instead of cleaning them one by one. 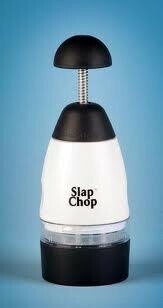 Cleaning is so easy when we use the Rapid Chop. Because of the 6 knifes, one chop is equal to 6 chops when we are using the normal knife. Therefore, you just need 5 or 6 seconds to make a salad or anything. It's too convenient! Someone tells me that his mother chops things very fast. Of course, you can cut the food as skillful as his mother. You can chop whatever you like such as green onion, salmon and even beef. Also, it will not make your chopping board becomes dirty. Why? it is because you can put a cover to cover the Rapid Chop! IS IT EXPENSIVE!!!? I NEED TO BUY ONE!!! Deservedly, no one will buy expensive things. However, Rapid Chop only costs $35! It is affordable for everyone. Also, it will not occupy a lot of space. Therefore, try Rapid Chop quickly! You can buy it in every supermarket!